Cars would not be my favorite Pixar franchise. I thought Cars was okay, but nothing special and Cars 2 was tremendously terrible. So I approached the third installment in this series with a lack of interest. There is no doubt that this is considerably better than Cars 2. 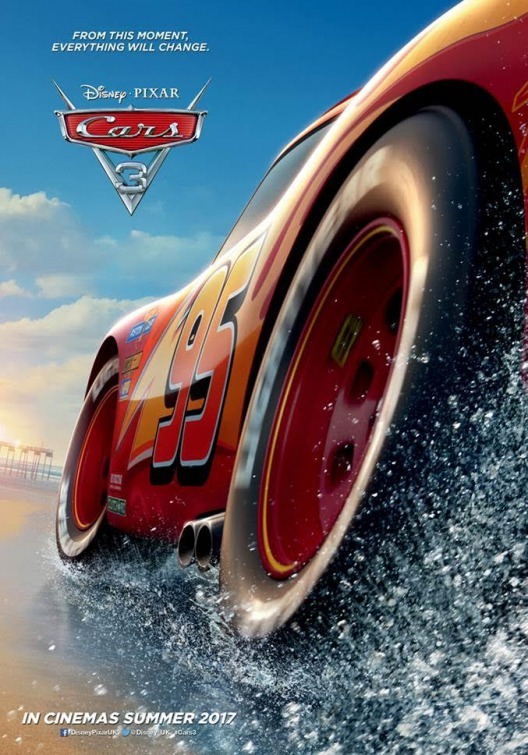 The film returned to focus its attention on Lightning McQueen (Owen Wilson) and also returned to the world of racing, instead of trying to jam Mater (Larry the Cable Guy) into a heist movie. Cars 3 features an aging Lightning McQueen, trying to stave off the oncoming might of a new wave of young and technologically superior racers. Unfortunately, Lightning has a terrible wreck and it puts his future into question. Changing this to an underdog story fits this franchise much better than the previous one did, and the limiting of Mater to a few short scenes was, most likely, a bright move. Instead, we see Lightning trying to retrain to return and recapture the glory of his past. He fins a new sponsor (Nathan Fillion), a new trainer Cruz (Cristela Alonzo) and a new purpose. However, the new way of training was not having the desire effect, so Lightning needed to look into the past to finds his new inspiration for the future. Cars 3 is definitely formulaic. There is nothing in the story that we haven’t seen before. In fact, if you were to compare it, the story compares very closely to several Rocky movies (in particular Rocky 3). Although this type of formulaic storytelling is common for many animated films, Pixar movies are generally held to a higher standard. Cars 3 does feel like the laziest of the Pixar movies. The first part of the film is unexceptional, if not dull. The film really starts to pick up when Lightning and Cruz go out to the beach to start their “unconventional” training. There is a sequence with Lightning and Cruz at a demolition derby that is probably the strongest sequence in the film. The final race was both predicable and a bait-and-switch that I did not like much. Without spoiling too much, there was a scene earlier in the film where we see an old race featuring Doc Hudson and I knew exactly how that film would factor into the finale… or at least, I knew somewhat, because there is a change that happened that kind of made me roll my eyes and made me question the legality of the situation. I thought the ending was weak. The animation is tremendous, and certainly is on par with the best of Pixar. The cars themselves as well as the background at the racing tracks and the environments are beautiful once again. There is a lacking of real emotion that usually is included in Pixar animations, but there is a nice message of believing in yourself and not giving up and parts of the film are reasonably entertaining. This is no The Incredibles 2, but Cars 3 is better than Cars 2.